NAIROBI, Kenya, January 29, 2013 (ENS) – One suspected poacher from Tana River County was shot dead on a private ranch Sunday after a fierce gun battle with Kenya Wildlife Service rangers. An intensive hunt for five accomplices who escaped arrest is underway in Tsavo National Park, says Kenya Wildlife Service spokesman Paul Udoto. Six elephant tusks were recovered, along with two axes, a weighing scale, sufuria mosquito nets, three AK 47 rifles and 574 rounds of ammunition. Kenya Wildlife Service Director William Kiprono led a high powered delegation to the scene this morning and showed journalists the criminals’ hideout. The man’s death brings to four the number of suspected poachers killed in this week, after the killing of three others in Shimba Hills National Park in Kwale, said Udoto. 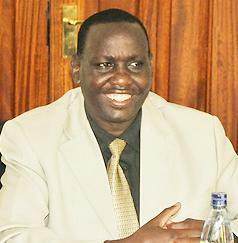 Appointed to head the KWS last October, Kiprono warned poaching syndicates that their days are numbered. He said the government has put all security agencies on red alert over the poaching menace. and incredible demand for ivory in some Asian countries. Kiprono called on owners of private ranches like the one where the suspect was killed to vet all herders and report suspected criminals to security agencies. He said the government “had no policy to kill” and gave priority to arresting suspects for prosecution in courts of law. He dismissed as “diversionary” any unsubstantiated claims of involvement of KWS staff in poaching. Director Kiprono said KWS has scaled up surveillance at Kenya’s ports in recent days to catch smugglers making illicit consignments of wildlife products particularly ivory. He knows Kenya’s Jomo Kenyatta International Airport and Mombasa sea ports are important links on trade routes to international ivory smuggling destinations. 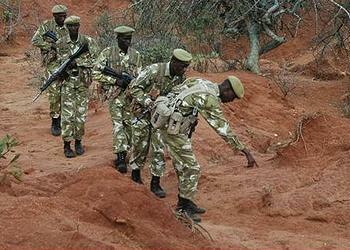 Kenya is going after suspected poachers in court as well. Kiprono said two suspects arrested over the recent seizure of 638 pieces of ivory in Mombasa were arraigned in court and denied bail. Other suspects are being followed, he said. Four Chinese men were arraigned before the Makadara Law Courts in Nairobi Mondayon charges of smuggling of ivory through Kenyan territory. The prosecution of the four suspects follows their arrest at Jomo Kenyatta International Airport while in transit from Lubumbashi, Democratic Republic of the Congo to Guangzhou, China, aboard a Kenya Airways flight late Sunday night. The four suspects were detected and seized by a joint security team from the Kenya Airports Police Unit, Kenya Revenue Authority, national carrier Kenya Airways and the Kenya Wildlife Service. Gu Guisheng, Qu Rongjun, Lu Xuefeng, and Wang Chengbang were found in possession of assorted pieces ivory products: five pendants, 23 bangles, a pen holder, 28 beaded bungles, 40 chopsticks, six necklaces, five pieces of worked ivory and two pieces raw ivory weighing 9.6kgs. They were booked at the Jomo Kenyatta International Airport Police Station awaiting arraignment in court. In Naivasha, three Chinese nationals and a Kenyan driver were arrested Friday as they tried to smuggle a dead spitting cobra out of Hells Gate National Park. The suspects, who are workers of a construction company in the park, were arraigned in a Naivasha court on Monday morning. They denied the charges of illegal possession of government trophy and failing to report to Kenya Wildlife Service. The suspects were released on a cash bail of Ksh10,000 each. The case will be continued on February 7, 2013. An interpreter is also being sought to aid with the prosecution. Translators are in demand in Kenyan courts to make Chinese and Vietnamese wildlife poaching and smuggling defendants intelligible to the English or Swahili speaking Kenyans. Last week, a magistrate at the Makadara Law Courts ordered that five suspected ivory smugglers holding Vietnamese passports remain in police custody until an interpreter is found to aid in their prosecution. An investigation into this contraband is still ongoing.